Monstrum Fish, Chelsea Waterside Park, Manhattan. Photo by Max Giuliani, Hudson River Park Trust. When Monstrum, a Danish playground-design firm, was asked to make playgrounds on the roof of the Lego House in Billund, Denmark, they knew one thing: they couldn’t be made of Lego. The exhibition building is full of Lego-based installations, games and, above all, playbricks, as visitors are encouraged to build whatever their imaginations conjure. The new playgrounds had to have the same sense of creativity without being made of movable parts. 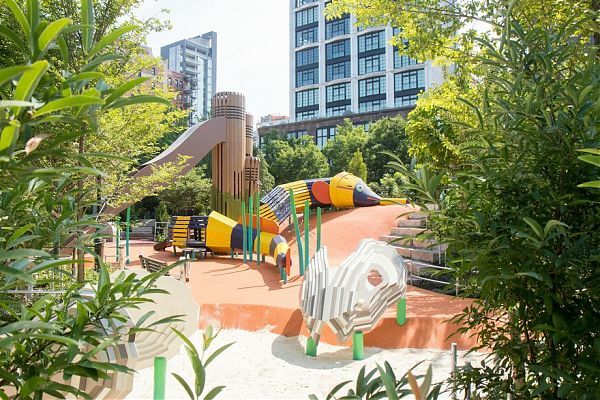 “Since the playgrounds are up in the air we decided to have everything mounted firmly into the ground, in order not to risk anything being thrown overboard,” says Jesper Vilstrup, general manager of the Lego House. Instead Monstrum, which has built an international portfolio of playable fish, rockets, spires and birds, took the adventurous scenarios depicted on boxes of Lego as inspiration and decided on a theme: “How to get to Lego House”. Each area of the playground would be like a snapshot of a journey. There is a submarine caught in a fish net attacked by a sea monster, a hot-air balloon landing in a cornfield full of scarecrows, a helicopter made of wood and raised up high on thin steel poles that illustrate air currents whipping around it. The steel poles aren’t just for show: children can climb them to get to the helicopter, slide down to make their escape or ignore the vehicle above and simply swing between them. In each scenario, the child pilots his or her play, deciding how high to climb and how deep to descend into whatever adventure narrative they have devised. The playgrounds are stage sets, and the children are actors writing their own scripts.